In the worst meltdown in franchise history, the Bucs go down to the 4 - 11 Raiders 24 - 31 and are officially out of the playoffs. During the game, the Bucs lost Cadillac Williams to another knee injury, so he is most likely out. Monty Kiffin is now off to coach with his son as the defensive coordinator for the Tennessee Volunteers, so he is out. 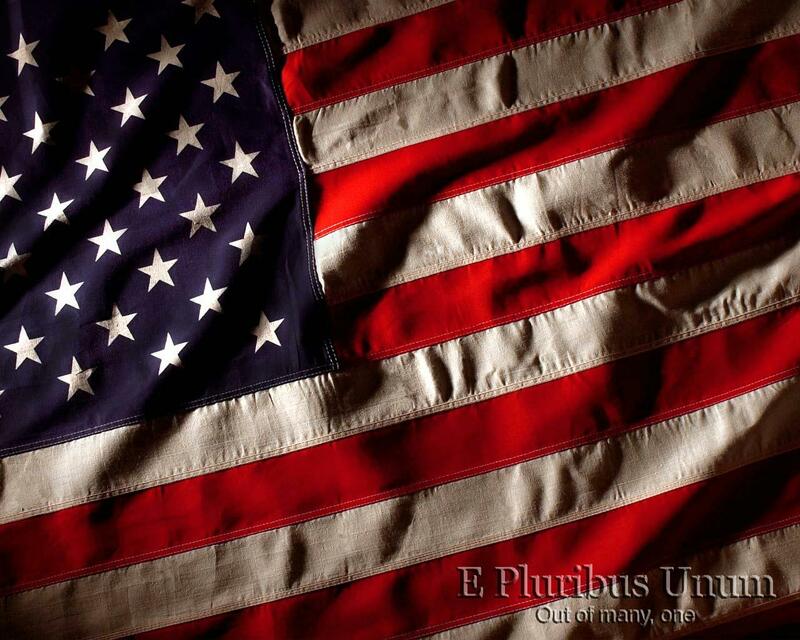 This is just what we know so far. Many questions remain to be answered. 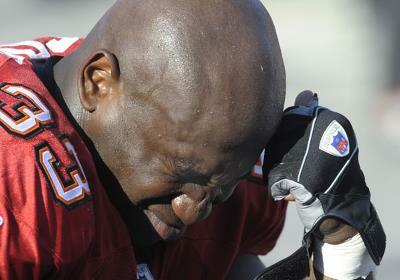 Will Jon Gruden, Ronde Barber, Derrick Brooks, Michael Clayton or Jeff Garcia be back next year or are some of them out? After the meltdown this year, one has to wonder how many fans will renew season tickets and how many are out. The only thing for certain is the Bucs now have the number 19th pick in this year's draft in April. A lot of questions need to be answered before then. The Bucs are now on the clock. The Bucs have been on a losing streak as they have lost their last 3 games and perhaps a chance to go to the playoffs. By losing to Carolina 38 - 20, Atlanta 13 - 10 and finally last weekend to the Chargers 41 - 24, the Bucs are running out of time to make the playoffs. This weekend the 4 - 11 Raiders come to town in what is a must win game for the Bucs. In order for the Bucs to make the playoffs, they need a win against the Raiders and the Eagles to win over the Cowboys on Sunday night. 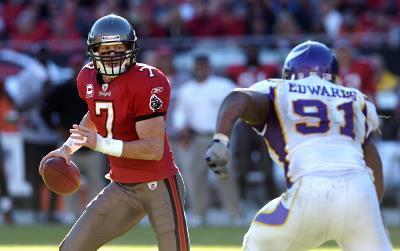 The Bucs battled the Saints this weekend in a windy and rainy NFC South match up. Just like in their previous meeting, the game was closely contested throughout the game as the Bucs escaped with a 23 to 20 victory. Things seem to be coming together as the Bucs' defense has been on fire as of late and is peaking at the right time to make a playoff push. The offense is also improving as they are getting healthier by the day and key players are returning for the first time this year. Next Monday night the Bucs go on the road to face the Carolina Panthers and the winner takes control of the NFC South Division. After spotting the Lions a 17 point lead in the first quarter, the Bucs came roaring back to win by 18. The Bucs have swept the NFC North this year with their latest victory over the Lions 38 - 20. The Bucs also rolled out the Cadillac who looked a little rusty, but with the season ending injury to RB Earnest Graham, it couldn't have come at a better time. With this win, the Bucs find themselves on top of the NFC South at 8 - 3 followed by the Panthers at 8 - 3 and the Falcons just a game behind at 7 - 4. The Bucs play their NFC South foes over the next 3 games starting with the Saints this Sunday. A lot of questions will be answered over the next 3 weeks and the Bucs should be up to the task. The Vikings came to town with the idea that they could be more physical than the Bucs and steal a win. The Bucs rose to the occasion and matched the Vikings physical play and kept them scoreless in the second half. 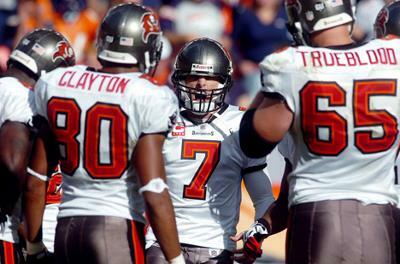 With Jeff Garcia at the helm, the Bucs battled to a 19 to 13 win improving the Bucs' record to 7 - 3. The Bucs must focus on not looking ahead as they travel to Detroit to take on the 0 - 10 Lions. This is a road game they must win if they hope to catch the Panthers in the NFC South race. The Buccaneers overcame a 24-3 deficit in Kansas City to defeat the Chiefs in overtime, 30-27. Bucs' rookie running back Clifton Smith returned a kickoff 97 yards for a touchdown in the second quarter to make it a 24-10 game. It was Tampa Bay's second kickoff return for a TD in franchise history. Bucs' quarterback Jeff Garcia threw a 24-yard touchdown strike to wide receiver Antonio Bryant late in the fourth quarter to cut Kansas City's lead to two points. On the two-point conversion attempt, Garcia dropped back to throw and hit Smith in the end zone to tie the game at 27. Matt Bryant hit a 34 yard field goal in overtime to give the Bucs a thrilling 30 - 27 win. The Bucs get a much needed rest next week as they are on a bye. The Cowboys beat Tampa Bay 13-9, dropping the Bucs' record to 5-3 and knocking them out of first place in the NFC South behind 6-2 Carolina. 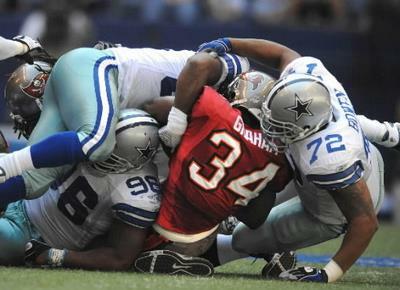 The Bucs' defense held the Cowboys offense, led by backup QB Brad Johnson, to just one touchdown. However, it proved to be enough vs. Tampa Bay's offense, which failed to score a TD. The Bucs had plenty of chances to win in Dallas as Tampa Bay's offense reached the Dallas 25 on five different occasions, but sacks, penalties, poor execution and a missed 51-yard field goal limited the Bucs to just nine points from three field goals. The Bucs try to rebound this weekend in Kansas City as they take on the Chiefs. The first prime time game hosted in Tampa Bay since 2003 and the hometown crowd was just as interested in the outcome of the final game of the Rays-Red Sox American League Championship game as the Bucs. The Bucs won 20 to 10 over the Seattle Seahawks, and the Rays beat the Red Sox 3-1. Oh, but wait, there was more. 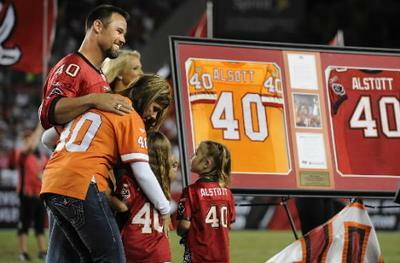 Mike Alstott was honored with a pre-game video chronicling his illustrious Tampa Bay career. He was also honored at halftime by the Buccaneers organization, but for some reason, his jersey wasn't retired as most people expected. Next week the Bucs travel to Dallas to take on the Cowboys. 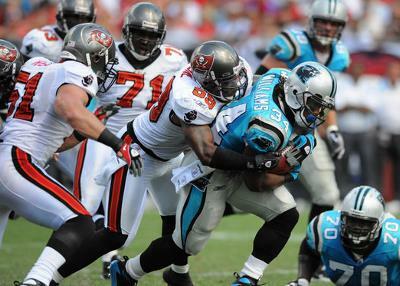 Carolina quarterback Jake Delhomme was picked off three times as the Buccaneers ran away to a 27-3 victory. It was the first time the Bucs had beaten the Panthers at Raymond James Stadium since 2002. The Buccaneers are now in a three-way tie for the NFC South lead with Carolina and Atlanta. All three teams have a 4-2 record, but the Bucs have a half-game lead over both the Panthers and the Falcons due to wins over those division rivals. This week a very dangerous Seahawk team comes to Tampa desperate for a win. 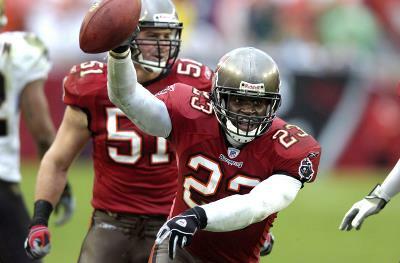 The Bucs lost in Denver to the Broncos on Sunday, 16-13, and also lost starting QB Brian Griese to a shoulder injury. 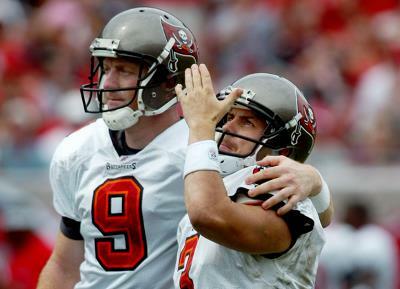 Former starter Jeff Garcia replaced Griese, and led the Buccaneers to one touchdown in four drives. In addition to Griese, middle linebacker Barrett Ruud left the game with an injured knee. The Bucs' defense kept Denver out of rhythm for much of the game but couldn't prevent the game-winning scores late in the fourth quarter. The Bucs are 3-2 on the season and host the 4-1 Carolina Panthers next Sunday. After burying his son, Matthew Tryson last Saturday, Matt Bryant returned on Sunday to kick for the Buccaneers. In honor of his son, Bryant was a perfect 3 for 3 in field goals as well as extra points. Everyone at the game knew he would come through as the Buccaneers downed the Green Bay Packers 30 - 21 on Sunday. Brian Griese threw 3 interceptions and 1 touchdown in the win, while the defense created 4 turnovers. This weekend they travel to Mile High to take on the Denver Broncos. 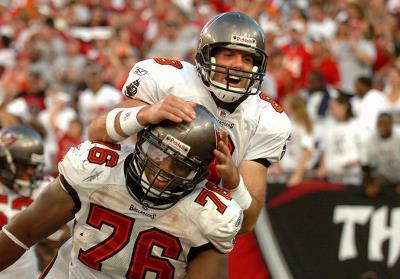 Despite 3 turnovers and 6 penalties and being down by 10 points late in the fourth quarter, the Buccaneers rallied behind QB Brian Griese for a fourth quarter comeback and overtime win. With the emergence of QB Brian Griese as the Bucs' starting quarterback, the Bucs wasted no time attacking the Bears through the air. Griese threw a team-record 67 passes for 407 yards and 2 touchdowns including a 90-yard game-winning field goal drive to give the Bucs a stunning 27-24 victory. The Packers come calling next week as the Bucs try to improve on their record in Tampa next weekend. The Buccaneers earned their first win of the 2008 season in convincing fashion over the Atlanta Falcons, who were coming off a very impressive win over the Detroit Lions in their season opener last week. Tampa Bay's running game and defense were both key in the 24-9 victory over Atlanta. 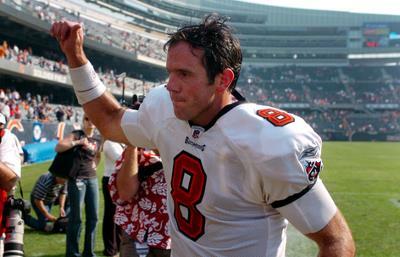 Bucs' QB Brian Griese completed 18-of 31 passes for 160 yards and one touchdown with no interceptions. All this after head coach Jon Gruden demoted QB Jeff Garcia last week. Let the circus begin!